Leanne Ford plays with texture and contrast—and embraces an (almost) all-white palette—in her newly renovated home. On Ford: Top by Isabel Marant isabelmarant.com; Skirt by Ronen Chen ronenchen.com; SHOES by Alaïa alaia.fr. White-on-white adds to the airy feel of Ford’s office nook, while also having a dramatic effect. Tejn Lambskin Rug $15 ikea.com; Vintage Chair from Garden Style Living gardenstyleliving.com. The different vignettes in Ford’s home show the versatility of her favorite shade. Tejn Lambskin Rug $15 ikea.com; Vintage Chair from Tri-State Antiques tri-stateantiques.com. A common theme is Ford’s love of white—from the painted vintage briquettes in the kitchen and living room to the master bathroom shower curtain made from an old ship’s sail. “White is the silence between the chords, the pause in the poem,” she explains. “It can be taken in any direction.” The color acts as a calming unifier in the eclectic space. Hanging Lamp from Big Daddy’s Antiques bdantiques.com; Table Lamp from Garden Style Living gardenstyleliving.com; Vintage Linen Duvet Cover by Matteo Home from $234 matteohome.com; Vintage Linen Bedding by Matteo Home from $31 matteohome.com. Ford layers a pale palette in inspired ways, like repurposing a ship’s sail into a shower curtain and artfully displaying her collection of vintage dresses. Hanging Light Fixture from Tri-State Antiques tri-stateantiques.com; Brass Mirror from Garden Style Living gardenstyleliving.com; Shelving Unit from Garden Style Living gardenstyleliving.com. Large Mirror from Garden Style Living gardenstyleliving.com; Assorted Cutting Boards from Garden Style Living gardenstyleliving.com. Vintage Russell Woodard Chairs 1stdibs.com; Koldby Cowhide by Ikea $199 ikea.com. 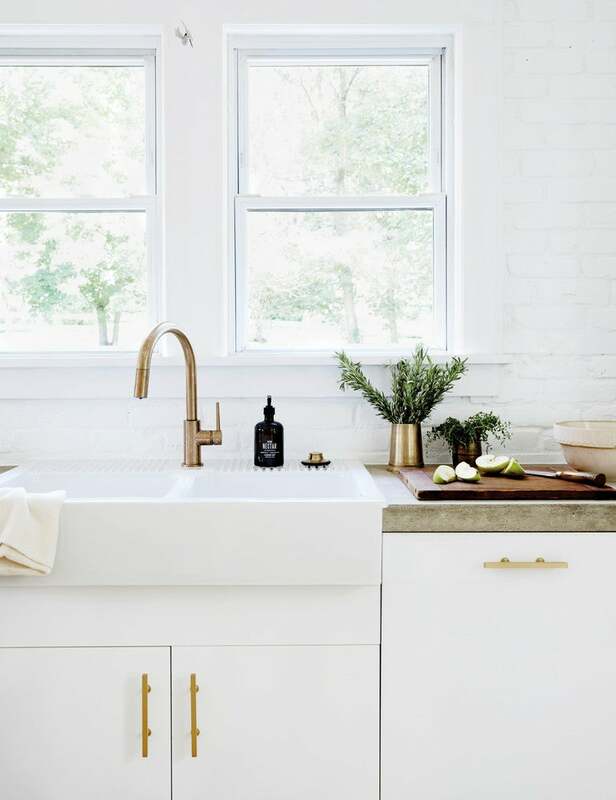 Brass fixtures, raw materials like cement, and darker accents, such as a large-format black-and-white photograph, ground the space. Iselin Steiro by Diego Uchitel from $750 themilkgallery.com; Nouveau Flat Top Freestanding Bathtub by Americh International americh.com.